It's New Year's Eve, and while much of the world gets set to ring in 2019 and say bye bye to 2018, Kanye West is spending his time tweeting at Drake again — sparking up their beef, then calling a truce and then finally deleting it all. To refresh your memory, the pair have very much been feuding in public this month, with the whole thing already dragging in Kim Kardashian West, Pusha-T and even Ariana Grande. 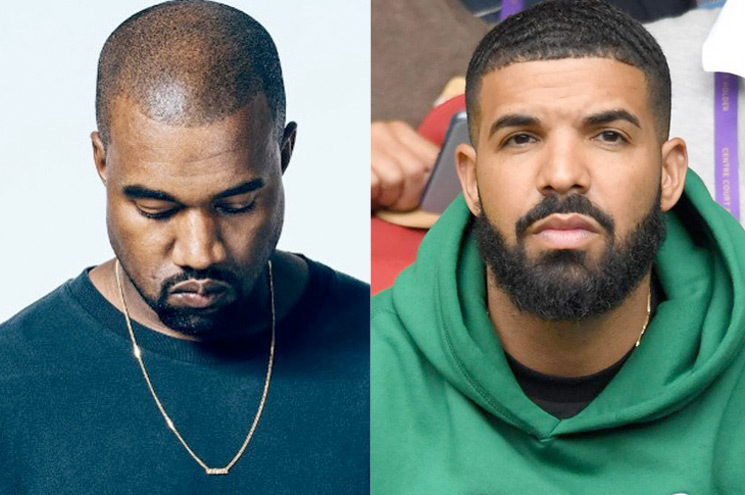 But once again, Kanye put his sights squarely on Drake today, and he's unleashed a new wave of tweets directed at the rapper, with the whole thing appearing to end in a truce of sorts. Kanye starts things off pretty aggro, saying Drake followed his wife on Instragram and mentioned Pusha-T's fiancé in a song. "He dodged me for months when I extended olive branches to talk and then called to threaten me," Kanye posted. "This man tried to used my family's song to get at me He been trying to pick a fight since the pool line. Who's bright idea was it to tell Drake to follow my wife on Instagram ? This person is not Drskes [sic] friend." UPDATE (1/2, 3 p.m. EST): It appears Kanye got his (deleted) wish, as Drake has now unfollowed Kim Kardashian on Instagram. However, Kanye soon seemed to have a change of heart, and eventually wrote, "I love everyone even Drake. That's my whole thing." And while for a second there we thought Kanye was offering some kind of truce, he then deleted each and every tweet that mentioned Drake. Luckily, you can see see the thread below, with the deleted Drake tweets still containing Kanye's original text.